(COMMENTARY) Fasting is to the Christian what strength training is to the participant of any sport. Well, perhaps any sport except poker. It is challenging, monotonous and builds the discipline necessary for success in the sport. In our modern age, however, many believe the practice of fasting has faded significantly in western churches. Despite the apparent decline of fasting within the western church, conversations concerning this discipline occasionally emerge during Lent. “I decided to give up Instagram for Lent,” we might hear one young member of a church announce. Many of the other members simply offer a smile and another chimes in, “I’m doing the Whole30 for Lent!” One extraordinarily brave individual usually emerges to declare, “I am giving up meat, dairy, sugar, caffeine, alcohol, oil, grains and most other major food groups.” Many leave this conversation feeling discouraged, rather than encouraged, by their community. Some authors attribute the unpopularity of fasting in the modern western church to the presence of excess food within many homes. Others believe that materialism stands between western Christians and fasting. However, a look at the traditions within the Eastern Orthodox Church suggest another alternative for the decline of fasting in the west: While western Christians today view fasting largely as an individual activity, Eastern Orthodox Christians practice fasting communally. The traditions within the Eastern Orthodox church build constructive community around fasting by counteracting sentiments of superiority and by augmenting fasting with feasting. The Eastern Orthodox Church begins the season of lent with Forgiveness Sunday, during which the priest reads Matthew 6:14: “If you forgive men their trespasses, your heavenly Father will forgive you; but if you do not forgive men their trespasses, neither will your heavenly Father forgive you your trespasses.” After the service concludes, the members of the church gather together and ask forgiveness from one another before beginning the fast. This practice involves each member of the congregation approaching every other member and saying, “Forgive me.” The other member responds, “God forgives, I forgive,” and the two exchange a kiss on the cheek. Julie Cohen, an Eastern Orthodox Christian, observes regarding this tradition, “Whatever is going on in the world around us, and in our own little worlds, this ritual breaks in with a reminder of transformational love and the possibility of reconciliation.” If a member entered the church feeling proud before this service, it would certainly be difficult for her to maintain that feeling after such an exchange. As the season of Lent draws to a close, the members of Eastern Orthodox churches gather together for the Pascha (Easter) vigil. This service, which begins on the Saturday night before Pascha, includes prayers and scripture intended to prepare the community for the celebration of Christ’s resurrection. At midnight, the Liturgy begins, the Lord’s Supper is distributed and the members of the church gather for a feast. Each member or family of the church will have prepared a dish to share with the others, and the members of the church break their Lentin fast together. This celebration often lasts into the early hours of the morning and is a time of great joy within the church community. At first glance, these verses seem to disallow fasting in a communal manner. However, it is important to remember the context of Christ’s commands as well as the commands themselves. In this passage, Christ warns against theatrical fasting, which is distinct from fasting within community. While the former encourages pride, the latter often brings about greater humility than fasting alone. When fasting within a community, Christians ought to be a source of encouragement and accountability for one another rather than a means to gratify conceit. While the traditions of the Eastern Orthodox Church create opportunity to fast communally, it is not necessary to convert to Orthodoxy to practice fasting in this manner. 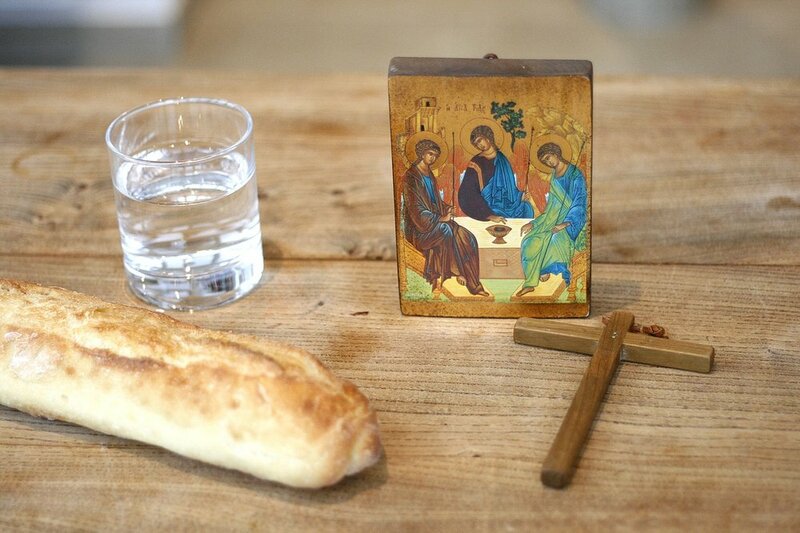 Within your own church, and even within your own family, you can begin Lent by offering forgiveness to one another verbally and conclude Lent with a feast. By adding these communal elements to your fast, you will likely find greater encouragement and joy during the season of Lent. Emily Shirley is a senior at The King’s College in New York City who converted from Protestantism to Eastern Orthodoxy in 2016.